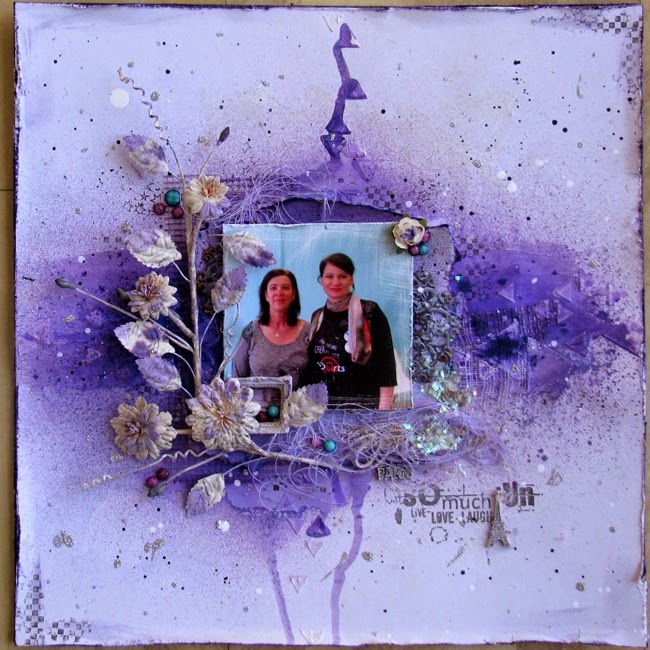 Having done a class with Ayeeda in Paris it seems fitting to enter her challenge with a layout done in her style that uses a photo of us together-taken at the event. I do hope I've done her proud. I've tried several techniques that she showed us and used lots of her products. The challenge is based on using your favourite colour. Hmm, difficult as I have several but I guess if push came to shove-and it would have to be a big shove- it would be purple. Just don't tell pink, turquoise or lime green. as well as distress inks, prima flower, metal and resin embellishments and various stamps.I really enjoyed putting into practice what we did at the show which I will post next time. Karen, this is really eye-catching - I've been zooming in trying to see how you've put it all together! Such detail and layering ... Lovely photo of you too :). I think it turned out beautifully! thanks for joining us at 13 arts! Love the different shades of purple and the triangles. Absolutely gorgeous colours, I love Purple. you can not feel sad when you see this vibrant colour. Fabulous texture and stencil work.